Solihull Barons put Nottingham Lions to the sword. Picture by Steve Crampton. SOLIHULL Barons registered their first NIHL North Division One points of the season with a convincing 11-2 victory over Nottingham Lions. Barons did not take long to open the scoring, with Matt Maurice slotting home from close range just 20 seconds after the puck drop. The advantage was then doubled as Niklas Ottosson found Luke Brittle in the slot for the Barons second goal with barely seven minutes on the clock. The third followed soon after when Marcus Maynard fired home but the visitors pulled one back after 12 minutes through Paul Stanley. Barons then restored their three-goal advantage just a couple of minutes before the end of the first period when Brittle bagged his second of the game. Within two minutes of the start of the second period Barons made it 5-1, with Brittle completing his hat-trick. This was quickly followed by a goal from Matt Maurice before Dale White added the seventh. Nottingham pulled a goal back in the 32nd minute as Cameron Pywell slipped the puck under Josh Nicholls. However, the period would end 8-2 to the Barons as Ottosson once more provided for Brittle who lifted the puck over Nottingham goalie Ashley Smith’s blocker. The scoring ways continued for the Barons in the third period as Elliott Farrell spun the puck into the Nottingham net early in the final 20. With ten minutes to go, Ed Eaton lofted the puck into the roof of the Lions goal to push Solihull into double figures and with three minutes left on the clock, Barons debutante Daniel Mulcahy got number 11 after converting a pass from Ottosson to wind up business for the evening. 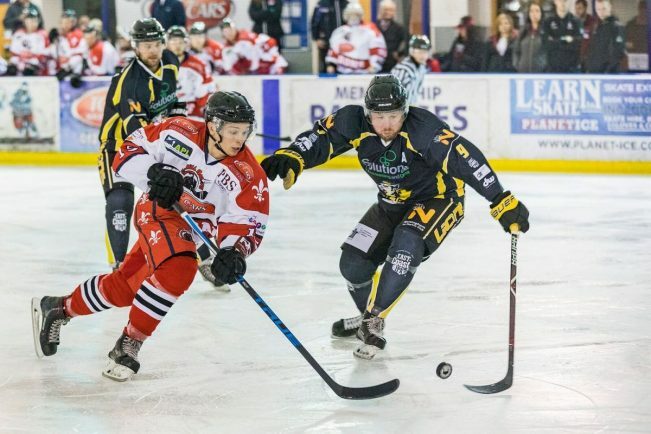 Barons travel to Ice Sheffield on Saturday where they will take on Sutton Sting.